While many celiacs feel the same way upon hearing their diagnosis, the reality is that the world is a safer place for our stomachs than it ever has been. And there are plenty of wonderful, naturally gluten free grains out there for experimenting and enjoying. Given his reaction, however, I was worried about my trip to Italy. I did not know if there would be any food for me, or if I would need to bring snacks of my own. I was surprised to find that my fears were very misplaced. Italy was one of the easiest places to enjoy food as a celiac. Already know you want a gluten free translation card? You can buy my Italian card here, as well as Japan, Greece, Spain, and more! What ISN’T Safe for a Celiac in Italy? Upon my return from Italy, I waxed poetic about how much I could eat. The first reaction from every single person was precisely the same: “oh Italy must be accommodating its tourists!” Not the case. It was obvious that the dietary changes were not rooted in tourism. Even tiny towns had knowledge of the disease, and had been exposed to it sufficiently that they made adjustments in what they offered. I recall seeing a Dutch study time ago stating that modern wheat varieties have higher toxic gluten content than traditional varieties. Then there’s the problem of overexposure. Wheat and modified starch are everywhere, so Italians are certainly more exposure than others as we are big pasta and bread eaters. According to the Italian celiac association, about 1% of Italians are celiac. As a consequence, is not surprising that you find lots of gluten free options in Italy. In Perugia we even have a gluten free restaurant and we’ll have a Gluten-Free Festival at the beginning of June. But one thing still nagged: the country didn’t just know about celiac disease, they accepted it. They embraced that this was an issue and moved around it to accommodate their meals, and did so with gusto. I asked Letizia and she gave a thoughtful response: that Italians are very conscious of the connection between health and food. In Italy, not being able to stomach wheat is more than an inconvenience or fad diet. That resonance has translated to an institutional empathy that might shock Americans. In addition, alternative flours are prevalent in Italy as well. Chickpea and chestnut flours have been part of Italian cuisine for centuries. In the nineteenth century, an Italian agronomist noted about Tuscany that “the fruit of the chestnut tree is practically the sole subsistence of our highlanders” (Targioni-Tozzetti, pub. 1802, Volume 3: 154). And in the twentieth century, Adam Maurizio, who wrote a seminal book on the history of edible vegetables in 1932 (called L’histoire de l’alimentation végétale depuis la préhistoire jusqu’à nos jours, for those inclined) discussed chestnut trees as being available not just for the fruit of the tree, but also for making into bread when grinding that fruit into flour. Unlike in North America, where these new flours are trendy but not firmly braided into our history, Italians have been using ground corn, chestnuts and chickpeas as substitutes for hundreds of years. As with the other gluten free cards in this series, this was written in detail in English, then translated into Italian by native speakers. It includes not only wheat, barley, and rye, but also the other grains with gluten (kamut or farro) used in Italian food. And it aims to help celiacs travel safely, and with comfort that their needs are going to be explained to native Italian speakers even if they don’t speak the language. I have used several different translation cards on my travels, and still got sick. I may be more sensitive than some celiacs, but even a small amount of contaminated oil for frying, or soy sauce in the food, is enough to make me ill for days. Let alone the joint pain later that week! has gone through TWO translations to ensure accuracy. A big thanks to Alanna Tyler and Letizia Mattiacci for their help in translating this card. 100% gluten free corn pasta. GET IN MY BELLY. For the most part, the following suggestions are for you to be able to walk into restaurants that are not specifically gluten-free, but that have options for you on the menu. As with the other gluten free guides I’ve written, I find it far more satisfying to eat safely where I can, versus sequester myself in GF restaurants all the time. Yes, it’s great to know things are safe to eat in those dedicated GF kitchens but the point of travel is to connect with other humans and learn about their culture and food — to me this is best done in general restaurants to the extent possible. Gluten free pizza, usually corn, chickpea and/or rice flour based. Confirm that shared pizza pans will not be an issue, and that this dough is not made on the same surface as the floured doughs — pizza shops often have quite a bit of flour being tossed around their kitchens! Gluten free pastas, which, like gluten free pizza crusts, are getting better all the time! Grilled meat and fish, including arrosticini (meat skewers from Abruzzo, typically sheep). Confirm no breaded/dredged flour on fish prior to cooking. Risotto and risi e bisi – confirm broth is gluten-free. Risotto is a creamy rice dish with many variations, most of which are made with butter, wine and onion as a base. Risi e bisi is a variation on risotto made with fresh peas and diced pork (usually prosciutto or pancetta, but sometimes bacon or ham is used). Both dishes should be safe, but confirm the broth is gluten-free. Insalata Caprese, a simple and delicious salad of tomato, basil and fresh mozzarella slices. Farinata or cecina or panelle, all regional variations of a chickpea flour flatbread. A farinata is likely to be thicker than a cecina, and a panelle is fried, while the other two are baked. All should be safe, but check to make sure they’re made with 100% chickpea flour. Ragu, which is a meat based pasta sauce, the most popular version of which is Bolognese sauce. Pesto, and pesto alla Genovese, pastes made of fresh basil and oil blended with garlic, pine nuts, salt and a hard cheese such as Parmesan or Pecorino. Sausages. Storebought sausages may contain flour in the casing, but if you confirm they’re gluten free, Italy provides some delicious options! Salsiccia fresca is a popular fresh pork sausage seasoned with fennel seeds. Mortadella ham is a large pork sausage often eaten as lunch meat that has little cubes of pork fat throughout it; Bologna sausage is similar. Bresaola is an aged, cured beef usually served in papery slices, while Prosciutto, sometimes called Parma ham, is cured ham served in a similar fashion. Stracciatella soup is sort of an Italian egg drop soup. Usually made with a meat-based broth and a mixture of eggs, parmesan, and seasonings slowly drizzled in, this soup should be safe if you confirm broth is gluten-free, and no flour, pasta or breadcrumbs are added. Porchetta (savoury, tender pork roasts) should be fine if not breaded. Beans and lentils – confirm that if broth is used it is gluten-free, and no flour or pasta or breadcrumbs are added. Polenta, boiled cornmeal that is served either hot as porridge or allowed to cool into a loaf before being sliced, baked or fried, and incorporated into other dishes. Caponata, a sweet and sour eggplant dish that’s fine for celiacs, as long as the cooking oil is not contaminated. Panna cotta and semifreddo desserts. Panna cotta is a decadent dessert of cream and sugar thickened with gelatin and flavoured in various ways. Semifreddo refers to any semi-frozen desserts, most of which will be made of eggs, cream and sugar, among other things. These treats should all be fine, if confirmed that no flour was added. Zabaglione is a dessert of egg yolks, sugar and sweet wine, sometimes served as drink, just be sure to order without cookies. Gelato IF gluten free, as many flavors do have gluten. Almost all cheeses (including parmesan and ricotta) — HUZZAH! Fresh vegetables and Meat Always an Option! Even when not on the menu, most restaurants will have a simple dish of steamed vegetables served with lemon. In the event you cannot find a side dish that works for your stomach, the chef will almost always oblige. Type of vegetables will vary depending on the season, but have in my experience always tasted better than at home. Many of the meals at lunchtime that I enjoyed were a version of whatever meat they had that day alongside some delicious steamed vegetables and a salad. 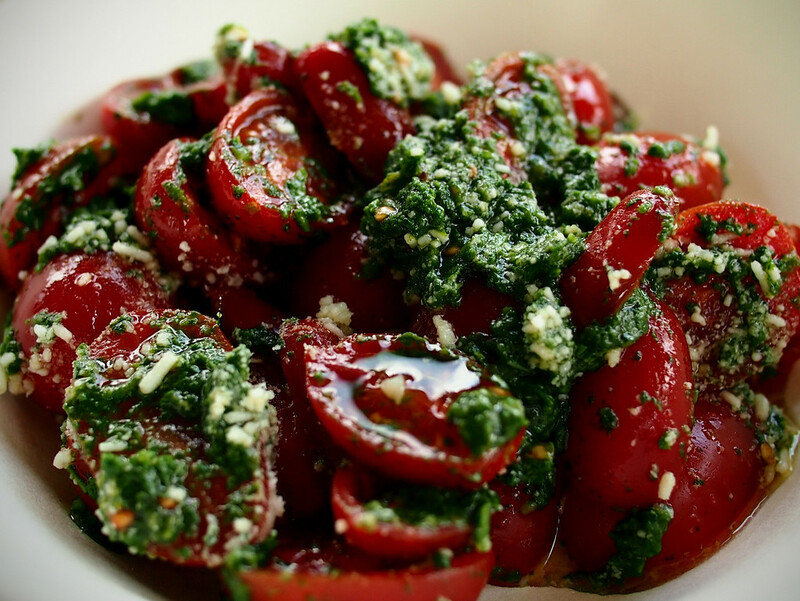 Tomatoes with pesto and olive oil. Can’t go wrong. Gluten is a huge part of Italian cuisine, and while there are some wonderful options that are naturally gluten free — and some great celiac-friendly modifications available — the reality is that most of the food has something we can’t eat. I wanted to list out a bunch of those dishes, just to make sure you have them in mind when you travel there. Pasta (most of the 600+ varieties, including ravioli, gnocchi (potato dumplings but are also always made with wheat flour, tortellini, passatelli and Pizzoccheri – which is often named buckwheat pasta, but also contains wheat). Pizza unless specifically labeled gluten free, and varieties of pizza like the folded calzone option. Breaded meats like cotoletta (veal cutlet) and cacciatore. Battered or breaded fish or calamari (squid). Arancini, rice balls coated with bread crumbs. Salami, which is a cured sausage that often has wheat. Some store-bought salamis will be marked as gluten-free but the customary way to prepare them does include gluten. Meatballs, and sausages like cotechino (a pork sausage similar to salami). Involtini (known in US as braciole), a way to pan fry meat that often uses a coating of breadcrumbs and cheese. Soups such as minestrone, pasta e fagioli, and acquacotta (bread soup). Ribollita, a Tuscan soup, may be made without wheat occasionally but it is rare. Panzanella — a bread salad. Cannoli — a Sicilian dessert. Pandoro, panettone, panforte, and Zuppa Inglese — all cakes / sponge desserts that are sadly off limits. Most types of bread including Piadina (flatbread) and pastries like Sfogliatella. Most types of gelato – unless clearly marked as gluten-free, I would avoid. 2) The Italian Celiac Association (available in English here) and the Umbrian Celiac Association. 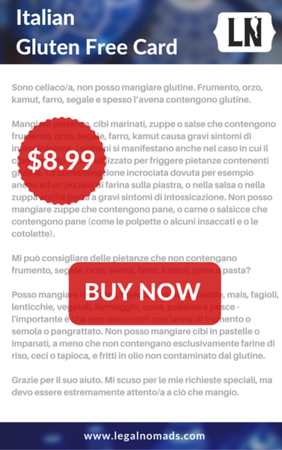 3) Mangiare Senza Glutine: iPhone app for GF Italian dining. 4) A searchable database of restaurants for celiacs in Italy, where you can browse by region. 5) The adorably-named Mr. Free Pizza Point, a site by Schär that helps you find “the best places for the best gluten-free quality.” Don’t be fooled by the name, though, the site only includes places where the restaurant staff was trained by Schär and the Italian Coeliac Association, and has guaranteed gluten free dough. Pizza-lovers, rejoice! Gluten-Free Italian: Over 150 Irresistible Recipes without Wheat — from Crostini to Tiramisu, by Jacqueline Mallorca. Covers the basics with easy substitutions, and lovely photography to accompany the recipes. The Gluten Free Italian Cookbook: Classic Cuisine from the Italian Countryside, by Mary Capone, which is a great compliment and focuses on rustic Italian cuisine. It’s delightful! 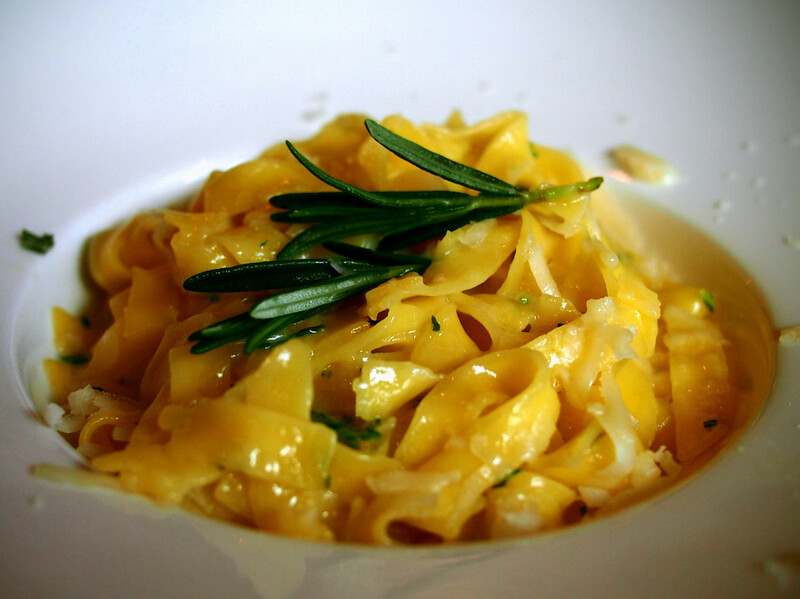 7) Sara Rosso’s gluten-free suggestions for Italy. 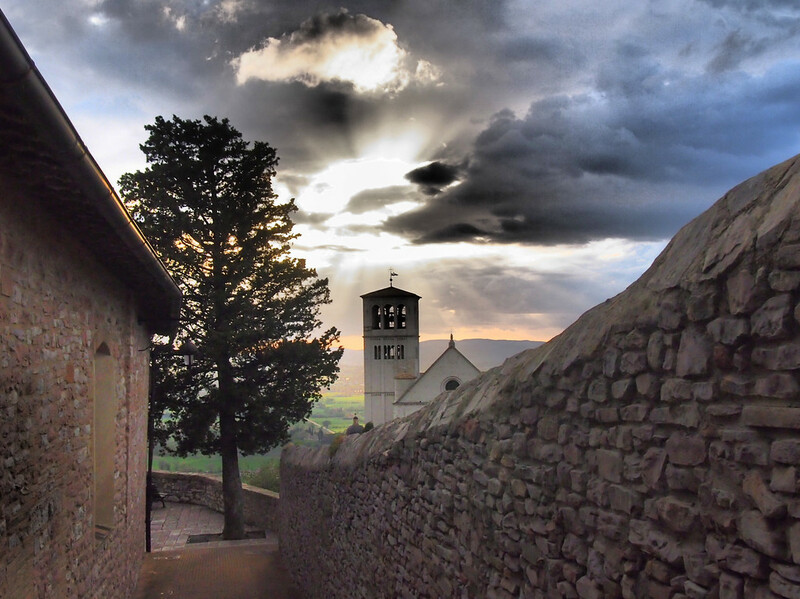 For more gluten-free guides please see my full gluten free travel page. 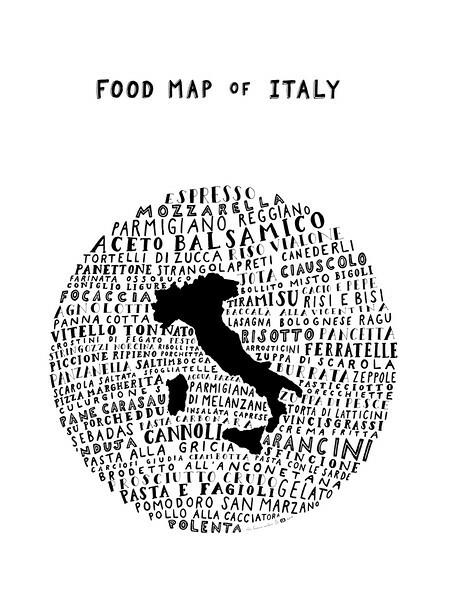 Now in the Legal Nomads Shop: hand drawn food maps of Italy! Totes, posters, t-shirts and more!